The ultraviolet source used in this system is a medium-pressure mercury lamp. These lamps are powerful sources of 200-400 nm ultraviolet radiation. In addition to high efficiency, these lamps are characterized by long-life and maintenance-free operation. Lamps are available in operating power levels from 1200 watts to 15,000 watts and arc lengths from 12″ to 77″, Please refer to the lamp product data sheet for standard lamp sizes. The support system consists of immersion wells, well head assembly and well support equipment which controls coolant flow and nitrogen purge. 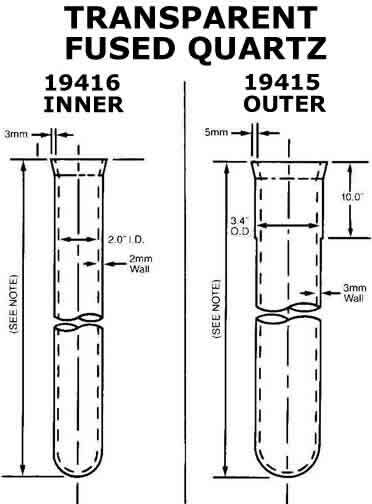 The lamp is placed in a quartz tube, sealed at one end, called an immersion well, The immersion well assembly consists of two quartz wells fitted one within the other. The wells are provided with heavy quartz flanges and are secured into a #316 stainless steel head assembly. The photochemical well assembly is sub- merged in a reaction vessel which allows maximum efficiency of radiated energy and prevents the lamp from contacting the reaction fluid. High-wattage lamps produce considerable heat. Excessive heat may cause the formation of deposits upon the outer surface of the immersion well, or surface flash on the inner surface of the inner well which contains the mercury lamp. If either of these formations should occur, a decrease in transfer of radiant energy from the lamp to the reaction medium results. This transmission loss in radiant energy can be prevented by using a cooling medium. In this equipment filtered water at a temperature not to exceed 150°F flows through the space between the inner and the outer well assembly at a rate of 1-to-4 gallons/ minute at a pressure of 40 p.s.i., (depending upon lamp wattage). The system is safeguarded in the inclusion of automatic pressure switches and electric circuit breakers arranged to extinguish the lamp if loss of coolant or nitrogen occurs. The system ceases to function until correct pressures are restored. During operation the external surface of the mercury lamp attains temperatures in the order of 500-600°C, These temperatures can promote the ignition of explosive vapors such as are frequently present in the processing room, In order to prevent vapor explosion by thermal reaction or by electric sparks, the inner well, which contains the mercury lamp, is maintained at a positive pressure of 4 to 5 p.s.i. nitrogen gas, This positive pressure prevents seepage of explosive vapors into the well, It also provides an inert atmosphere for the lamp frame and the external metallic parts of the lamp which can be damaged by the formation of ozone which occurs when oxygen is present. Reaction speed is also enhanced with the nitrogen atmosphere. The immersion wells are secured and sealed at the top by the well head assembly This stainless steel assembly consists of the electrical junction box, the nitrogen cap, the coolant cap, and the mounting flange. 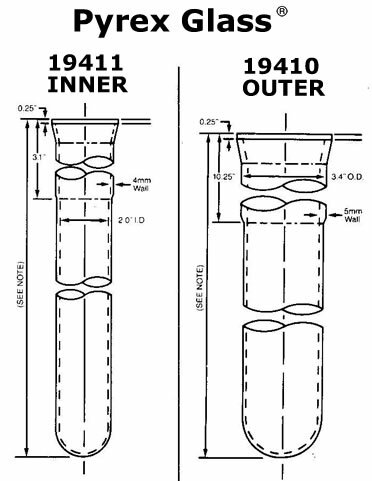 The design of the well head and flange is such that “0” rings and gaskets seal the quartz immersion wells and the mating male and female joints of the well head. When the electrical cap is removed, simple access is provided to the lamp mounting frame, and lamp removal and installation can be made, No tools are required to remove the lamp! The well support system houses the pressure switches and solenoid valves which control the flow of coolant and nitrogen. The switches and valves are interconnected prior to shipment, requiring only simple on-site hook-up. The well support system also contains pilot lights to indicate when the mercury lamps are operating and individual controls for each lamp. Since the well support system is mounted next to the reactor, all its components are “explosion proof and are suitable for operation in hazardous locations – Class I, Groups C&D. Selection of the lamp best suited to the application determines the minimum lengths of the outer and inner wells and also fixes the length of the nitrogen and water tubes. For best results, the bottom of the outer well should be at least five inches above the agitator while being sure the entire lamp is below the liquid level in the reactor. The reaction velocities of some photochemical processes are directly proportional to the intensity of the photosensitizing light. It is desirable to avoid abrupt changes in light output such as may occur when electric supply voltages fluctuate. Such fluctuations, if frequent or drastic, may affect the economics of the process. The power supply used with a mercury vapor lamp is a current-regulated constant wattage stabilized ballast comprising reactive and capacitive electrical components which are power-factor corrected to about 90%. This type of control automatically maintains the wattage of the lamp within narrow limits of a few percent for large variations in the supply voltage and regulates perfectly for all minor changes in voltage. For maximum life and use in unprotected environments, the ballasts are encased in weather-proof enclosures and immersed in oil. The control cabinet, a Nema 12 enclosure, contains the switching devices for the lamps and related circuits. The control console includes system start controls, selector switches for each lamp, “lamp on” indicators, primary ammeters and running time indicators. A master switch starts an automatic sequentially-operated “warm-up” that brings the system to full operating power. Calculating the amount of light energy required to produce product at a desirable rate. The most common reactors used in photochemistry are the stirred-batch and continuous flow. Some applications may require a hybrid reactor of the user’s own design, Hanovia systems will operate vertically or horizontally mounted. * Last three digits of well part number signify well length (A) in inches e.g. ,046 = 46 inches. The power supply used in Hanovia photochemical systems is a voltage-regulated constant wattage stabilized ballast, It consists of an” air-gap type transformer and a inductive and combination of capacitive reactance components which are power corrected to approximately 90%. One stabilized ballast is required for each lamp. With input voltage variations of ± 10%, the ballast will maintain constant lamp power to within ± 2%. The ballast is encased in a weather- proof metal housing, containing transformer oil. Shedding New Light on Photochemistry! The products of industrial photo- chemical reactions are agricultural chemicals, intermediates, caprolactam, and vitamin D, among other substances. Photochemistry is also used in the curing (polymerization) of specially formulated printing inks and coatings. 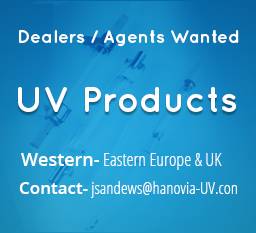 Hanovia has introduced the totally- packaged photochemical reactor system to simplify installation and increase operating efficiency. A photochemical reactor system consists of four elements: 1) The ultraviolet source; 2) Support equipment; 3) Power supply; and, 4) Electrical controls.